I have a love-love relationship with quiche. It is such a delicious savoury dish, and because you can vary the filling, it never gets old for me! I tend to have a pie shell in my freezer at the ready, so that whenever my quiche mood strikes, I can satisfy it immediately. I love that the preparation time for quiche is relatively low, but the recipe can last a few days if you’re feeding one or two people. It’s easy to pack for lunch, and it’s a good way to get your protein in at any time of day because it’s breakfast, lunch, and dinner-friendly! 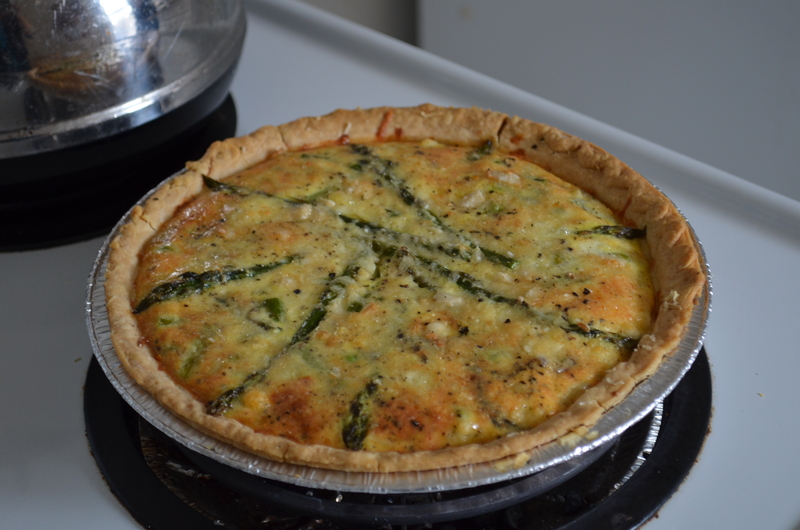 This quiche is a bit pared down compared to my usual veggie-loaded quiches (for my other quiche recipe, click here!). In fact, as my sister and I where preparing this quiche yesterday afternoon, we joked about how using fewer ingredients makes a quiche seem fancier… whereas lots of ingredients make a quiche feel more homey and hearty. So this is our take on snooty high-class quiche. The parmesan layer gets golden brown and crunchy, and the sweetness of the onions complements the fresh asparagus perfectly. I promise you, it is very, very good! The quiche, fresh out of the oven! I love omelettes for a quick lunch or dinner. I often make tomato and cheese omelettes, but adding a bit of basil pesto to the beaten eggs before adding them to the skillet made this particular one stand out! As you know by now, I really like to modify classic recipes to make them healthier and tastier. This egg salad recipe scores higher than regular versions on both the health and taste scale.